Marine biologists have, for the first time, found a whale skeleton on the ocean floor near Antarctica, giving new insights into life in the sea depths. The discovery was made almost a mile below the surface in an undersea crater and includes the find of at least nine new species of deep-sea organisms thriving on the bones. The research, involving the University of Southampton, Natural History Museum, British Antarctic Survey, National Oceanography Centre and Oxford University, is published online in Deep-Sea Research II: Topical Studies in Oceanography. Worldwide, only six natural whale skeletons have ever been found on the seafloor. Scientists have previously studied whale carcasses, known as a ‘whale fall’, by sinking bones and whole carcasses. Despite large populations of whales in the Antarctic, whale falls have not been studied in this region until now. “At the moment, the only way to find a whale fall is to navigate right over one with an underwater vehicle,” says co-author Dr Jon Copley at the University of Southampton. Exploring an undersea crater near the South Sandwich Islands gave scientists just that chance encounter. “We were just finishing a dive with the UK's remotely operated vehicle, Isis, when we glimpsed a row of pale-coloured blocks in the distance, which turned out to be whale vertebrae on the seabed,” continues Dr Copley. When a whale dies and sinks to the ocean floor, scavengers quickly strip its flesh. Over time, other organisms then colonise the skeleton and gradually use up its remaining nutrients. Bacteria break down the fats stored in whale bones, for example, and in turn provide food for other marine life. 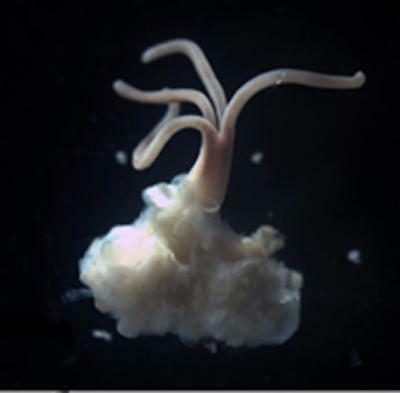 Other animals commonly known as zombie worms can also digest whale bone. The team surveyed the whale skeleton using high-definition cameras to examine the deep-sea animals living on the bones and collected samples to analyse ashore. Researchers think that the skeleton may have been on the seafloor for several decades. Samples also revealed several new species of deep-sea creatures thriving on the whale's remains, including a ‘bone-eating zombie worm’ known as Osedax burrowing into the bones and a new species of isopod crustacean, similar to woodlice, crawling over the skeleton. There were also limpets identical to those living at nearby deep-sea volcanic vents. 2. The whale skeleton was discovered during RRS James Cook Voyage 42 in January 2010, for which the Principal Scientist was Professor Alex Rogers of Oxford University. The expedition was part of the CheSsSo (Chemosynthetic Ecosystems of the Southern Ocean) research programme, funded by the UK Natural Environment Research Council and led by Professor Paul Tyler at the University of Southampton. 3. Diva Amon is a PhD student at the University of Southampton and Natural History Museum, co-supervised by Dr Jon Copley at the University of Southampton and Dr Adrian Glover at the Natural History Museum. 4. Funding for the research is provided by the Graduate School of the National Oceanography Centre, Southampton, University of Southampton and the Leslie M. and Judy A. Crouch Educational Trust.